and Egypt, I’ve learned in the past few days, but there are general patterns in the long history of successful and unsuccessful revolutionary movements that help to understand what’s going on. Revolutions are about coalitions. They succeed when people who care about overthrowing the government more than anything else in the world are able to mobilize and unite with people who care about lots of other things. The zealots are important, to be sure, but you’ll get a better sense of how things will turn out by watching those who are not normally committed to revolutionary change. Evey day when we wake up, we decide how to spend the day. Mostly, there’s not a lot of agonizing about big changes on food, work, family–and the state of the government, for most of us, is off far in the distance. Yesterday’s decisions create momentum; the world around us creates constraints and change is always risky. Risk is relative: not going to work might lose you your job; the other donut shop might not be so good; opposing the government could get you killed. Obviously, this depends upon context, and upon your position in the world. Most people take to protest when they believe that there is an urgent problem, that change is possible, and that their efforts might matter. Each day’s news can change how we think about urgency, possibility, and our own potential efficacy. A few brave and committed people–and a few crazy people–care less about whether their efforts will be effective than about living up to their values. These are people who are willing to starve or burn themselves to make their lives their arguments, hoping to inspire others. Most of us, however, think about tomorrow as well, and are more likely to take action when we think it’s a little less risky or a little more likely to be effective. Or, they come to a judgment that whatever the risks, inaction is now impossible. We watch for signals from others about their prospects and their judgments. These signals affect our judgments, and whether insurgents protest, whether loyalists defect, and whether passersby get involved altogether. Signals spur others to actions which send signals to others, creating cascades of action, and ostensibly stable regimes fall or powerful insurgencies falter. Everyone figures out who they can trust–and how much. Dissidents decide whether they’ll be alone or with friends when they take to the streets. Generals calculate whether they are more likely to keep their commands–or even their lives–with loyalty or defection. Ferdinand Marcos’s claim to have won re-election, Marcos decided that he could not count on the Army to defend him. US Senator Paul Laxalt, speaking on behalf of President Reagan, told him that he couldn’t count on the United States either. Marcos left for Hawaii, and the insurgents claimed the state. Likewise, across Eastern Europe in 1989, state Communist governments learned that they could not count on their own armies, nor on the Soviet Union, to repress dissent. Dissidents learned as well, and flocked to the streets. Mainstream political figures defected. In some countries, like Hungary, the lessons were quickly learned and the transitions non-violent. Watching the Soviets stay out warned the ruling authorities and emboldened the opposition. In other countries, like Romania, there were dramatic moments of truth when the military refused orders to put down the rebellions. And sometimes governments facing insurgencies can find loyal bureaucrats and soldiers willing to fire on their countrymen. 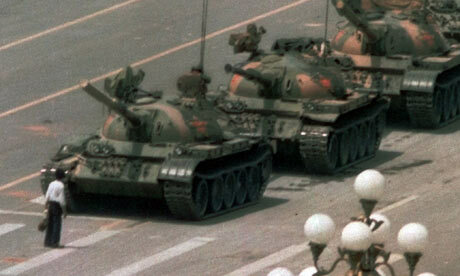 Democracy activists in Tiananmen Square in 1989 didn’t anticipate that the government would be willing and able to successfully mobilize the military against them. They guessed wrong. When governments respond to dissent with reforms hope to break a movement coalition, bringing some opponents the prospects of political influence, and making it possible to repress or ignore others. Well-crafted reforms can lower the urgency of protest, but reforms can also lower the risks of taking to the streets. At this writing, Egyptian elites with grievances, including Nobel-prize winner, Mohamed ElBaradei, have lined themselves up with the people in the streets–vigorously. The risks of doing so appear much smaller as the regime’s weakness is exposed, and the risks of not doing so, as the numbers in the streets increase, seem greater and greater. encouraging him, privately and publicly, to do exactly this.) The promise is that the dictatorship of the past three decades will end, but not just yet, and not this way. The question is whether this reform is just too little and too late. And the news of the revolutionary movements in Tunisia and Egypt has spread across the Arab world, encouraging authorities, dissidents, and bystanders to make new judgments about what’s possible. This entry was posted in Uncategorized and tagged China, coalition, Egypt, Hungary, protest, revolution, Romania, Tunisia, violence. Bookmark the permalink.